"A Review of Simple Blueprint Programs." Using floor plan software to create blueprints, and other drawings, is a great way to create the scalable plans that you need for your project. Whether you are designing your home, office, garage, kitchen, bathroom, rec room, deck or backyard landscape, using drafting software programs to construct floor plans, can make the task easier and more efficient than creating drawings by hand with a pencil and ruler. The list of the many different computer drawing programs available that can seem overwhelming. The good news is, many are available as trial downloads to give you the chance to try before you buy. We urge you to take advantage of this and test-drive several programs before deciding which one is right for you and your drafting needs. We have reviewed a few floor plan software programs below and have given a brief description of each drawing program. These drafting programs range from basic blueprint software to construction design programs. Some are completely free, while others are trial downloads of the commercial versions. TurboFloorPlan - Previous knowledge of drafting programs is not necessary for this 3D design tool. Design your home inside and out and create realistic looking walk throughs to help you decide which building materials, cabinetry, fixtures and more, that you would like to use. Smartdraw is a good CAD (computer aided design) software program that has multiple uses. You can use it to create architectural, mechanical and electrical drawings and more; much more in fact. 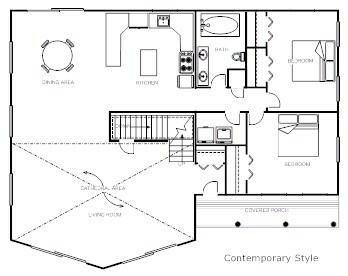 Smartdraw has uses beyond creating floor plans. You can also automatically create flow charts, organizational charts, communication visuals, process management and create up to 70 different diagram types. It is also fully integrated with the Microsoft Office program. There is a huge clip-art collection of floor plan symbols and templates, that makes use of simple drag and drop features. A highly recommended all inclusive CAD package that is easy for anyone to use. AutoCAD Floor Plan Software is created by Autodesk, and is the leading CAD design software in the world. AutoCAD is their flagship drawing program, however their are a variety of Autodesk products to suit every discipline. This is the CAD program used by our own office. 30 day trial downloads of AutoCAD, Autodesk 3ds Max, Autodesk Maya, AutoCAD Civil 3D, Autodesk Inventor, Autodesk Revit Architecture and AutoCAD LT. If you are looking for basic software to create plans, then AutoCAD LT may be all that you need. This lite version of AutoCAD can be had for a fraction of the cost of the full version. Google SketchUp is a fun and easy to use free drawing software program. It not only let's you draw floor plans and other drawings in regular 2 dimensional plan view. It allows you to turn your plans into a 3D model! The straightforward tools included with the floor plan software enables you to create 3 dimensional models of homes, storage sheds, a backyard deck, renovations to your home, boat models, airplane models and more. You will also have the ability to insert details, surfaces, simulate glass, and layout any project to scale. You can't go wrong with this free CAD program. SketchUp Pro is also available for purchase for professional engineering and architectural firms. If you need more floor plan software programs to evaluate, feel free to check out this extensive list of free computer-aided design software available for your review.